Vigorous exercise can be exhilarating, to be sure, but the key to a long, healthy life is simply taking regular walks. That’s the conclusion of a pair of studies published recently in the British Journal of Sports Medicine and the American Journal of Preventative Medicine. In both studies, researchers found that those who walked consistently had a 20 percent reduction in all-cause mortality. Those in the British study were 24 percent less likely to die from heart disease. Those are powerful statistics, and they underscore the value of getting your steps in each and every day. The Fitbit OS Gallery has a number of clock faces that can help motivate you to lace up your walking shoes. How it works: If you think of each day as a new opportunity to meet your health goals, then you’ll love Racer, which allows you to see how well you’re doing every time you glance at your watch. Each of your five daily fitness dashboard goals—calories burned, active minutes, distance, steps taken, and floors climbed—is displayed as a lane on your 5-lane race track, with icons marking your progress as the day proceeds. Once you’ve reached a goal (say, floors climbed), a little trophy appears at the top of your watch in the designated lane for that goal. Customize your racetrack with unique colors for each goal, as well as specifics such as the target number (of steps, calories) for the day or amount remaining to reach the goal. Ready? Set. Go! Download the clock face here. How it works: A trip to Paris. Your high school reunion. A milestone birthday. All can inspire you to lace up your sneakers or watch your calories in the moment with an eye on the bigger prize just ten (or 20 or 100) days later. With Days Until, that milestone event is displayed in a banner across the top of your clock face, so you’ll never lose sight of it. Customize the rest of the clock face with different colors for steps, calories, active minutes, distance and floors climbed. Three screens will show you 1) your current stats for each of those goals 2) the percent of your goal achieved so far and 3) how your progress that day compares to your daily average. Use that last screen to motivate you to take those extra few steps or to climb that last set of stairs before bed. How it works: Not motivated by numbers—or simply don’t want to see all of your stats every time you glance at your watch? Then Progress might be more your style. 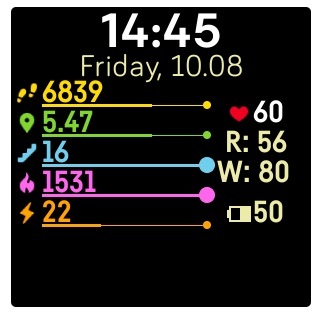 The only numbers you’ll see are the time, date and your heart rate, but as you reach your daily step goal, a color bar gradually takes over more of the watch face. Choose from one of nine color schemes, from Dawn or Violet to Lime, Blush or Aurora. Not to worry if you do want to check in on your daily health stats: One tap on the clock face will show you the rest. How it works: Reach for the stars. Climb the highest mountain. If those inspirational sayings speak to you, you’ll want to download Summit, a fun game/clock face designed to motivate you to reach your daily step goals. Each day, you start at the bottom of the mountain, unlocking surprises along the way to the top and your prize screen. A continuous heart rate reading and actual steps climbed can help you see how far you have to go. How it works: If you’re one of those runners who collects race bibs, you’ll enjoy Step Counter, which looks just like the smart bib of the future. Seriously, how cool would it be to have number of steps and current heart rate displayed on your chest during a race? Next best thing, of course, is to have all of that on your clock face, in addition to the date and time. Customize your “race bib” with one of 42 different colors, or program the bib to change colors when you’ve reached 30% and 80% of your daily step goals. How it works: Sometimes, all it takes to get motivated for a walk or run is the promise of good weather. With Smarty Weather, you can see at a glance whether or not the current weather is amenable to an outdoor jaunt, even if you’re nowhere near a window. (That’s especially helpful when you first wake up in the morning or if your office is inside-facing.) You’ll need to grant permission for the Fitbit app to access your location, and you’ll also need an Internet connection, as the clock face draws weather data from Yahoo Weather. How it works: Your Ionic and Versa collect a lot of cool data, but often, you need to click through multiple screens on your watch or mobile device to find it. Not so with Clocky3Acid, which displays all of your health statistics on one clock face. In addition to date, day, and time, you’ll also get the primary health stats—steps, distance, floors climbed, calories burned, active minutes—plus heart rate, resting heart rate, weight and battery power left. The super-elegant typeface means that all numbers appear crisp and clear; no squinting needed to see if that 3 is really an 8. If you own an Ionic or Versa and want to download the clock faces described above, you can find them in the Fitbit Clock Face Gallery. Simply, open your Fitbit app and tap or click the device icon in the top left. Tap or click “Clock Faces,” and then tap the “All Clocks” toggle in the top center. From there, you can browse browse clock faces by category, or use the handy search function.